It was early October and overcast and was just begging to be worn: I busted out the chunky knit for the first time this season. 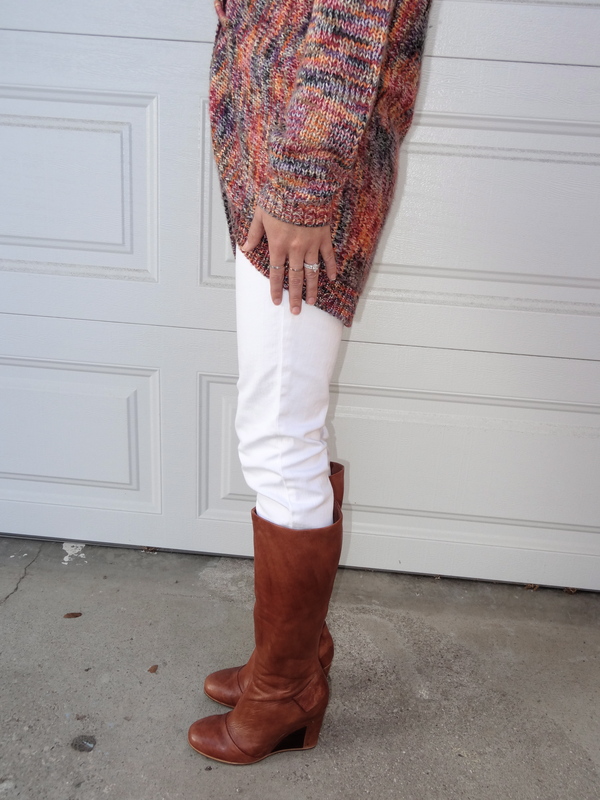 One of my most favorite things to wear, an oversized chunky sweater is classic and comforting with a hint of boho-chic. It keeps you warm on a crisp day, is a great cover-up when you have had one too many holiday treats, and still looks effortlessly stylish. When my mom and I saw this sweater at a quaint boutique last fall, we knew it was a must-have. The bold colors make it a perfect match with dark denim, brown cords, and (obviously) white denim. To add a bit of benevolence to our purchase, I bought my mom’s and she bought mine- charitable shopping at its finest. 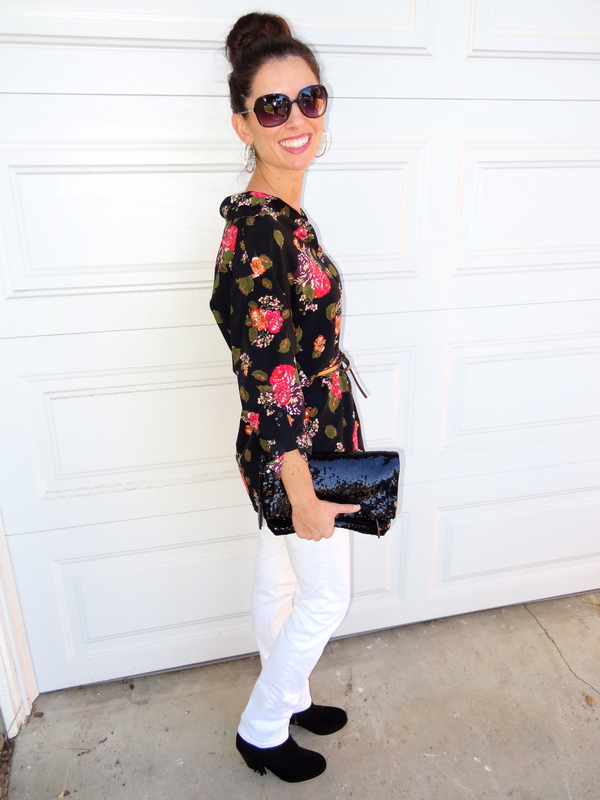 What is one item you can’t wait to bring out for fall? During my travels, I love to bring home a trinket or two to remind me of my time there and the memories I created. While most travel back with a coffee mug or a t-shirt that reflect the destination’s heritage, I, more often than not, travel back with clothes. This is especially the case when I travel out of country. Trends start sooner in other countries, especially in Europe, and I feel like I get to bring back a part of the future when I purchase clothes there. 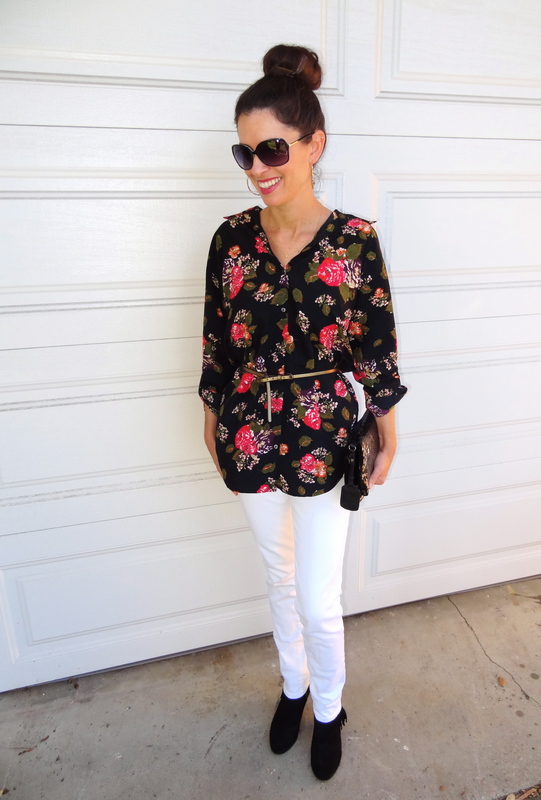 On a trip to Madrid three years ago, I picked up this floral blouse and I have worn it every fall season since. It is wrinkle-free so it travels really well and it looks great with both denim and leggings. 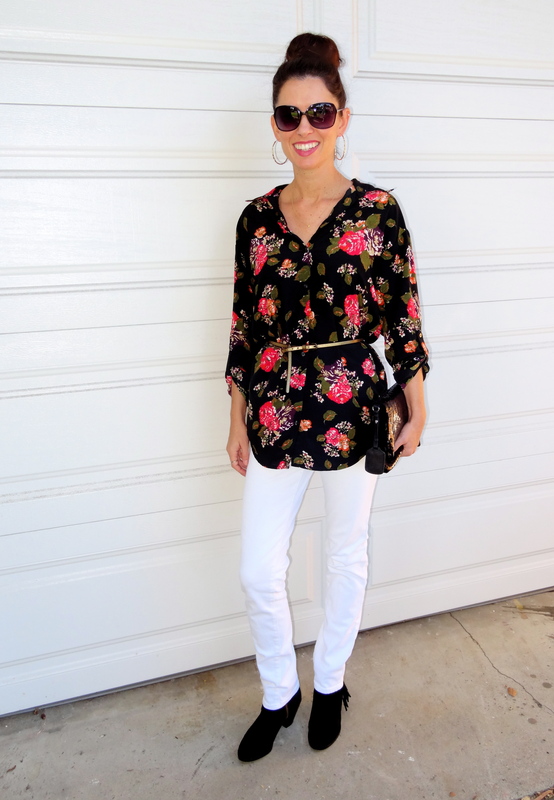 This is a great pairing to the white denim as it brings in fall colors to balance out the white bottoms. I cinched it with a skinny belt to accentuate the waist since the tunic is more of a blousey fit. What do you like to bring back as a souvenir when you travel? 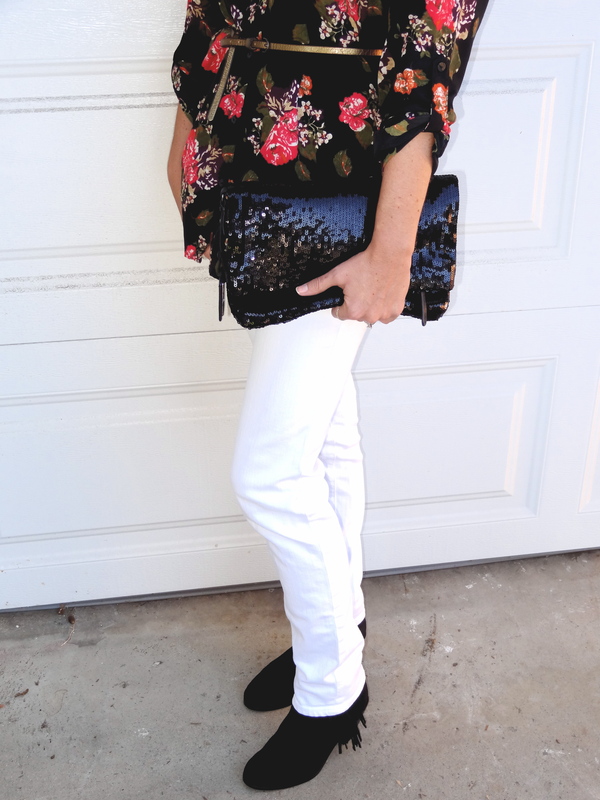 It is the quintessential fashion question: Are white pants after Labor Day a faux pas? The short answer is no. The longer answer is to make sure you are pairing said white pants with other season appropriate colors to bring the ensemble together. For example, closet the bright summer patterns in exchange for neutral hues in a darker palette as Jamie Chung, Cameron Diaz, Kristin Cavallari did above. Use fall trends such as leather, animal print, and dark graphic tees to modernize your white pants for the season. 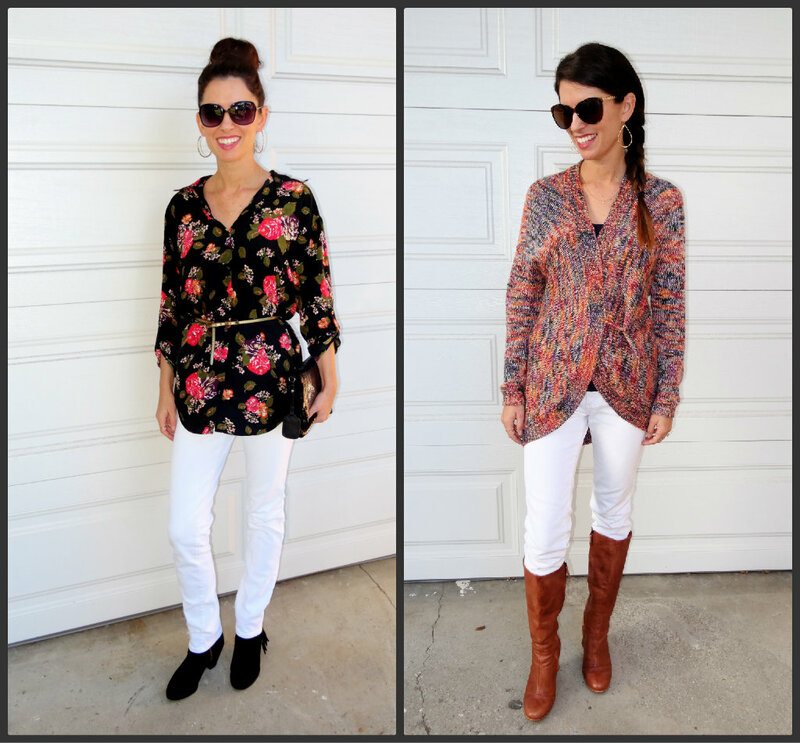 Check back in the rest of the week to see how I pair my white denim for fall!